Slovenia’s Postojna Cave has just welcome it’s 34 millionth visitor. One of the countries main tourist attractions, it’s fitting that the visitor who crossed the mark was a tourist from Italy. The lucky visitor received a luxury cruise for two people as part of a special promotion put on by the cave. At over 20 kilometres (12.4 miles) long Postojna Cave is the longest cave system in Slovenia. Of that, 5.3 kilometres (3.3 miles) of the cave is open to the public, making it the longest publicly accessible distance of any cave system in the world. In face, it has a train system inside that is used to ferry around tourists. 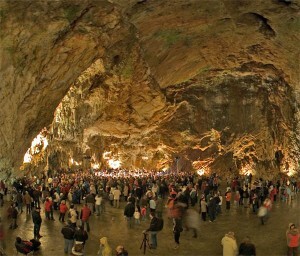 A room in the cave, known as the concert hall is large enough to accommodate as many as 10,000 people. Due to its exceptional acoustics, symphony orchestras, octets, and a variety of soloists have performed within.